We are doing this hike on a Saturday because it is a long way home afterwards, because it is fun to do hikes on Saturday once in a while. The plan is to car shuffle to Osler Bluffs, and hike south, across Pretty River, and come up through Singhampton Caves. If we do not have enough cars, we will hike down from Singhampton, go out as far as possible, and hike back, up through Singhampton Caves. 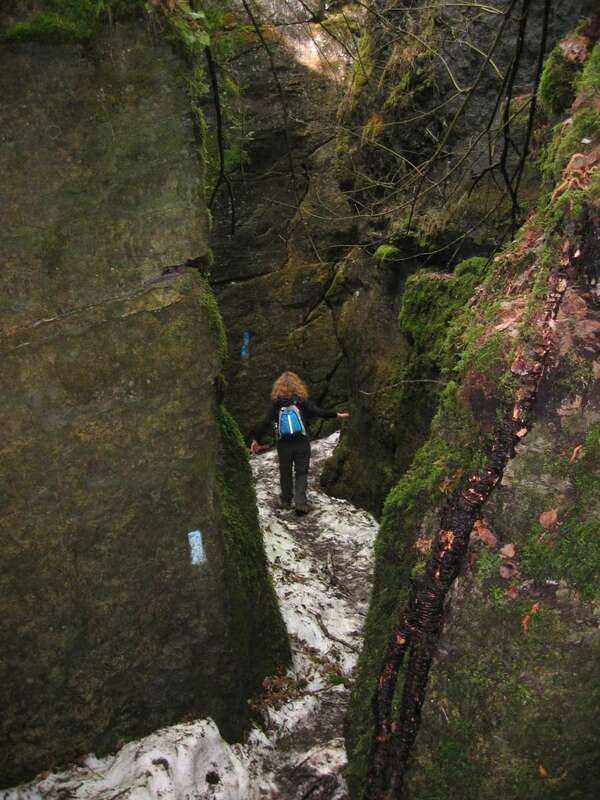 Check out Map 23 on your Bruce Trail guide. You have a Bruce Trail guide, right? Singhampton Caves are what I would call crevasses. They were created when huge blocks broke away from the cliff faces. The red dot on the map shows where we meet. That white stuff on the ground on the photo, is snow. The picture was taken 2006May27. The dolostone rocks retain heat, or the lack thereof. I recall this was really nice after a long day of hiking in the heat. From Yonge and York Mills, go east on the 401 to Highway 400. Make sure you are in the collector lanes. Go north on Highway 400 to Barrie, and Highway 26. Highway 26/27 and Bayfield Road are at exit 98. They are all the same road in Barrie. The exit numbers on Ontario superhighways are actually the kilometers from the beginning of the highway, so the exit is 98 kilometers north of Highway 401. There are shortcut routes from the Dunlop Street exits and Highway 89, but you are on your own if you use them. Go west on Bayfield Road, Highway 26/27 until you reach the Highway 26 turn-off at Midhurst. Take the Highway 26 turn-off west to Stayner. Drive straight through Stayner. Highway 26 turns north, to Collingwood, and you are now on Country Road 91. Drive though Duntroon. 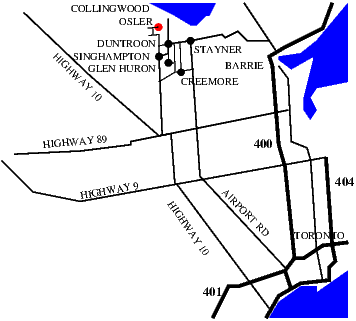 The road is now called the Duntroon Sideroad. Continue until you reach a T intersection. Turn north (right). At the end of this road, you will see a Bruce Trail sign. You are almost there! Turn left onto Eagle Crescent. Turn right at Northway Road, the next intersection. Turn right at Osprey Heights, the intersection after that. Drive to the end of the road and park. Here it is on Google Maps I can't figure out how to get the indicator on the correct side of the intersection. Parking is at the east end of Osprey Heights, as noted above. This hike is rated as a Class 3 hike. There are lots of hills. There will be some scrambling through Singhampton Caves. Hiking boots are strongly recommended. We could do as much as eighteen kilometers. Singhampton Caves are worth the effort. There is no parking or entry fee.